The practice of acupuncture began more than 3,000 years ago in China. Early observations of the predictable patterns in nature pointed to the realization of an underlying, cyclical flow of energy. We see this energy manifest most clearly in the change of the seasons. The tradition of Five Element acupuncture is based on the understanding of this cyclical flow of vital energy – also known as Qi. Each of the Five Elements – Wood, Fire, Earth, Metal and Water – represents a distinct quality of the Qi energy that is vital to the continual health and flow of nature. The Ancient Chinese observed that just as these essential energetic qualities can be found in nature, so can they be found in every living being. By understanding the relationships of the Elements within and using them as a guide, they could discover and treat the root of a person’s illness, restoring health to the body, mind and spirit.f treatment unfolds. 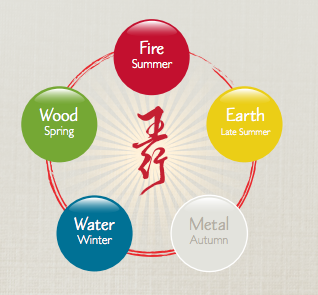 The Five Elements represent the five phases of Qi as it moves through nature and our bodies. The Elements work interdependently in an elegant and systematic balance, each one sustaining and supporting the next in the cycle. This cycle can best be seen in the change of seasons: Wood corresponds to the birth and growth of plants and trees in the spring. What is planted in the spring comes to maturity under the heat and vitality of Fire in summer. The warmth of Fire creates the abundance of the harvest of the Earth in late summer. After the harvest comes the decay of autumn, where the leaves falling from the trees nourish the soil and produce the mineral resources of Metal. The mountains and mineral rocks create and bind the flowing streams of Water, moving quietly under the surface of the ice in winter, which, in turn sources the germinating seed of Wood. The interdependency of this natural cycle is delicate. Even small disruptions can wreak havoc on growth and development. And so it is with the cycle of Qi in our bodies. When the energies of the Five Elements are functioning in harmony and balance within ourselves, we feel healthy, nourished and fully alive. The extent to which we live according to these natural laws is the extent to which we live in health. When one or more of the elements move out of balance, we may feel a reduced sense of well-being. We may develop various symptoms that show up at every level of well-being: physical, mental, emotional and spiritual. Five Element practitioners use the Law of the Five Elements as a guide in correcting the imbalance of energy within the body. They recognize that each individual is unique, and while their symptoms may be identical to another person’s, the cause of those symptoms depends on the individual. To determine the cause, the practitioner must first identify the patient’s Constitutional Factor, or CF. The CF is the first element to go out of balance in an individual and becomes the underlying disturbance in the patient’s energy. By restoring balance to the energy of the CF, rather than simply treating symptoms, the Five Element practitioner treats the patient as a whole, leading to a longer-lasting level of well-being. To determine a patient’s CF, practitioners follow sensory cues from the patient known as CSOE: color, sound, odor and emotion. Each element has its own correspondences that the practitioner is trained to see and hear in their patients. Diagnosing the CF through these clues allows the practitioner to focus on the specific meridians and points associated with the CF. Thus, a path of treatment unfolds. It’s a calling, this Five Element work. If you chose to stay with the calling, in time the nature of the work will teach you things deep and wonderful – in yourself as well as all people. Classical Five-Element Acupuncture provides a framework to enable us to discern and liberate conditions of our physical, mental, and spiritual vitality such that life purposes are more easily fulfilled; whether due to no longer being distracted by a rash, or once again seeing the opportunity of a great future where despair and depression once was. Learning the skill of seeing color, smelling odor, hearing sound, and feeling emotion is exhilarating; providing a poetic way to walk in the world that is not just a technique. This medicine reminds me of the oneness of all and the connections that we share. As patient and practitioner, it has certainly broadened my horizon and added to my appreciation of life. I am glad to have been called. It is a true gift to be part of the process of returning someone to their fundamental nature, and to watch them grow and shine. I am filled with gratitude to work in this medicine, in this tradition, at this school, and to continue to learn from my colleagues, students, and patients.